Box contains 16 assorted bars; It consists of 12 octagon magnetic stirring bars, "PTFE" with pivot ring and 4 fleas. 2 each: 7mmx2mm, 10mmx3mm, ½"x 5/16", 5/8 "x 5/16", 1"x3/8", 1½"x 3/8", 2"x 3/8", 2½"x 3/8"
22 round magnetic stirring bars. "PTFE" with removable pivot ring on 1" long and over. The box consists of 2 each: ½"x¾", 1"x 5/16", 2"x 3/8", ½"x 5/16", ¾"x 5/16", 1"x 3/8", 1½"x 5/16", 1¾"x 5/16", 2"x 5/16" and 1 each: ¼"x 5/16", ¼"x 3/8", 1½"x3/8", 1¾"x 3/8". Polygon stirring bars: "PTFE". Consists of 2 each: 10mmx6mm, 15mmx6mm, 20mmx7mm, 25mmx8mm, 30mmx8mm, 40mmx8mm, 50mmx8mm, 60mmx8mm, 80mmx10mm. 24 color coded octagon magnetic stirring bars: "PTFE". with pivot ring. Consists of 1 each: Yellow, Red And Blue: 1⁄2"x1⁄8", 5⁄8"x5⁄16", 7⁄8"x5⁄16", 1⁄2"x5⁄16", 1"x5⁄16", 1 1⁄2"x5⁄16", 2"x5⁄16", 3"x1⁄2"
These egg-shaped magnetic stirring bars provide its own pivot point. 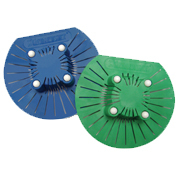 Designed especially for use in round-bottom vessels. 13 Egg-shaped spin bars, "PTFE". Consists 1 each: 3" x ¾", 2 each: ¾ "x 3/8", 1 "x ½", ¼" x 5/8", 1½" x 5/8 ", 1 5/8 x ¾", 2" x ¾". Add speed and efficiency to your mixing. The "+" shape creates a deep vortex and provides stability to your mixing. 5 SpinPlus magnetic stirring bars, "PTFE". Consists of 1 each: 3/8"x3/8", ¾"x¾", 1"x1",1 ¼"x1¼", 1½"x1½". 12 Micro Spin Bar magnetic stirring bars in assorted colors; "PTFE". Consists of 1 each of every color and size: red, yellow and blue: 8mmx1.5mm, 5mmx2mm, 7mmx2mm, 10mmx3mm. The "PTFE" Komet™ Spinbar® Magnetic Stirring Bar is made from a high-energetic magnetic material. That, combined with its octagonal shape, produce exceptional power although its length is only 50mm (1.969" with a 21mm (.827") diameter. The Samarium-Cobalt magnet is encapsulated in "PTFE". Its eight edges generate strong turbulence so liquids are thoroughly mixed and its stability is not impaired in vessels with curved bottoms. In addition, the risk of demagnetization caused by external magnetic fields is completely eliminated. Komet™ transmits torque loads 2 to 3 times larger than those of conventional stirring bars of this length significantly improving efficiency. These bars are designed for single use applications where efficiency and cross contamination is a concern. These economical bars have a "PTFE" coating which is chemically inert for high purity contact. The magnet is an Alnico V. Packaged 100 pieces/bag. Packed 12 bars per box. These magnet stirring bars provide strong turbulence at relatively low speeds, offering reduced surface contact and excellent centering characteristics, particularly in vessels with convex bottoms. Ideal for 'problem' liquids, highly viscous mixtures and metal particles in fluid. All sizes have solid PTFE end disks 20 mm (.79”) in diameter. Bar diameter is 8 mm (.315”). Just drop in place – prevents magnetic stirring rods from going down the sink. Conveniently capture magnetic stirring bars in containers, without contaminating solution being stirred. 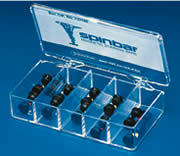 The Spinbar® Restrainer fits in one hand. When placed alongside the outer wall of a mixing vessel, it readily attracts and holds the stirring bar in place. As vessel is drained, the stirring bar is securely retrieved from vacant vessel. The Spinbar® Restrainer is molded of easy to clean high impact polystyrene. It contains a powerful magnet that attracts and holds magnetic stirring bars up to 80mm (3") long. 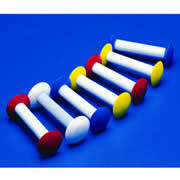 Polypropylene Stirring Bar Retrievers: Ideal for use with all stirring bars. The entire retriever is encased in a chemically resistant polypropylene, with a handy ring for hanging when not in use. "PTFE" Stirring Bar Retriever: A permanent powerful magnet encapsulated in "PTFE" and supplied with flexible "PTFE" cord. Simultaneous heating and stirring for more consistent mixing and dissolving. Speedy processing of frozen materials for greater efficiency. Purification of chemical compounds by preparing super-saturated solutions for re-crystallization. The Microwave Stirrer magnetically stirs inside a microwave oven by using the ovens turntable drive spindle as the power source. Many two step-processes can now be combined for increased efficiency and productivity. 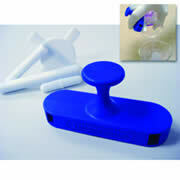 Use this Microwave Stirrer with virtually any microwave oven containing a rotary turntable. Perfect for mixing in test tubes, micro centrifuge tubes and other containers which are too narrow for conventional mixers. The stirring rod will also flare out for use in larger spaces. It comes with a clear vinyl carrying case, 4½"x1/4" stirring rod, and two "AA" batteries. Dimensions (including rod): 8"x¼"x1". Weight: 3 oz. Smooth 8" long hardwood. One end flat for mashing, one end sharply pointed for pin-point stirring. Useful tool for all laboratories needs to stir / mix substances. Glass rods are 5mm diameter, and come in three lengths. Policeman is rubber cover to fit 5mm rods above. The sealed end is cut at an angle to help stir at the bottom of container.